Director and co-writer Lee Unkrich helms the story with professionalism and a keen attention to detail. The opening sequence, fast becoming a Pixar staple, is a masterpiece. During these visually striking first moments, a climactic battle takes place between all of the principal toys everyone is familiar with. Woody (Tom Hanks), Buzz (Tim Allen), Jessy (Joan Cusack) and Mr. Potato Head (Don Rickles) take part in an epic faceoff that culminates in a mushroom cloud of monkeys from the Barrel of Monkeys. Eye-popping visuals topped only by the power of childhood imagination. That child would be Andy, and in this installment he is exiting that label and moving into adulthood. In the digital age, this obviously poses an even bigger problem for the toys. However, Toy Story admirably and elegantly shows us, with the latest modern technology, the power and importance our toys carry with them. When Andy’s toys think they are being thrown out, they hop in a box and are shipped to the Sunnyside Daycare Center. A seemingly Utopian paradise, they all feel at home again except Woody. Feeling an obligation to his owner, he flees. As it turns out, he was lucky. Andy’s toys have been tricked by the leader of the Sunnyside toys, a swarthy pink teddy bear of a dictator, Lotso (Ned Beatty). The toys are exiled to the kindergartner room of the center; trampled, thrown and chewed on until they decide they’ve had enough. Woody, who has found solace at the home of a child from the daycare, decides to rescue his friends when he learns of their fate instead of going to Andy’s on his own. I won’t say anymore plot wise, just know that Unkrich and the other writers do not skimp on the thrills or the emotion. They use their tools to make a film that is madly in love with cinema. The daycare center echoes Shawshank, Lotso its Southern-drawled warden. Add in a telephone that speaks like a detective from 50’s film noir, and you won’t want to watch anything but Pixar animation ever again. The voice acting, predictably, is excellent. Hanks and Allen continue to bring their iconic characters to life, as does the rest of the cast. Michael Keaton is excellent as Ken, finally completing himself when Barbie joins the daycare center. 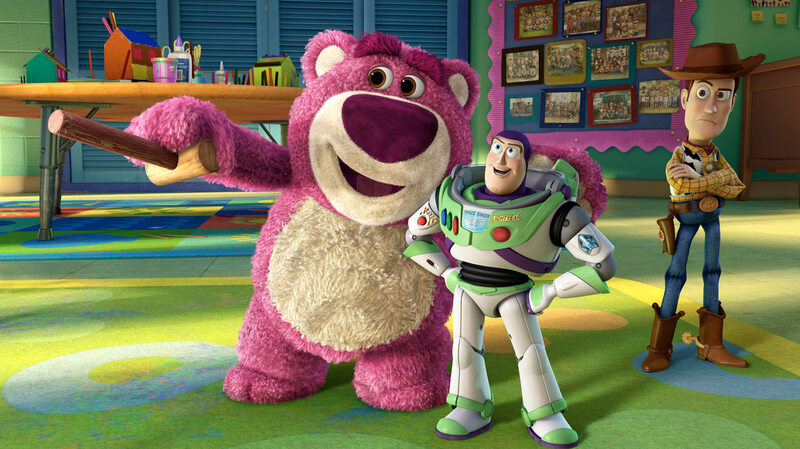 Beatty brings Lotso to life, and though he echoes the prospector from the second film a little too closely, his tragic back story helps give light to his reign of terror inside the daycare. There are several other new toys the creative minds at Pixar can be proud of. Big Baby is a damaged minion of terror, a blind follower of Lotso and a hilarious rendition of the state of modern horror films. Sadly, he’s more terrifying than anything in those. As this installment comes to a close, the final scenes will enthrall and uplift you. You completely live in the moment as the toys fear for their lives, and learn their emotional new fate. Either way, they do it together, like all of the best movie families do. This entry was posted in Reviews and tagged Animated movies, Barbie and Ken, Best movies of 2010, Buzz Lightyear, Don Rickles, False Utopia, Joan Cusack, Lee Unkrich, Michael Keaton, Pixar, Tim Allen, Tom Hanks, Toy Story 3, Woody by matterspamer. Bookmark the permalink. I adore this movie, probably one of the most enjoyable cinematic experience I’ve had in a while. I’ve yet to review it as there’s just so much to say, so maybe I’ll do it eventually. I’m just ok with UP but this one I cried so much almost from start to finish, especially the holding hands part, aw shucks! I’m hoping to do a Pixar-related post tonight if I can finish it… man, they seem to be the only people who can do a sequel justice! Absolutely great movie. So good. And one of the last scenes (if you’ve seen it, you know what I’m talking about) is one of the most intense scenes i’ve ever seen in a movie, let alone an animated movie. superb work.